An important tool for the Scrum built-in requirements engineering process is the Multi-Level Product Backlog. 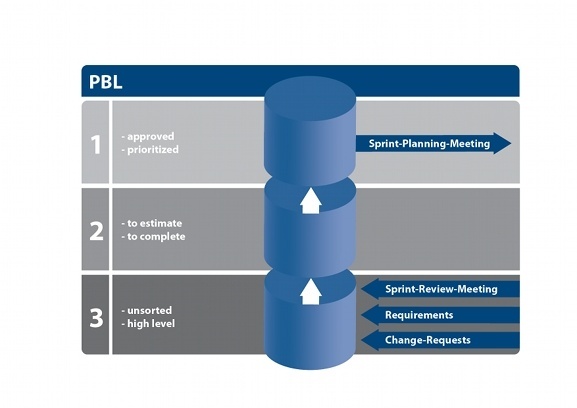 This section describes the structure and organization of an effective Product Backlog. This can be used for both the development and organization of Sprints as well as the collection of requirements not yet described in detail. The requirements come before any estimate or detailed description of Items. These are collected by the Product Owner. As previously described, these are established through workshops and recorded onto lists. Some activities are therefore carried out before a requirement can be estimated by the Team. The introduction of a Multi-Level Product Backlog is one of the possible activities. Here the requirements are collected (Stage 3), specified (Stage 2) and transferred into a state via quality gates between the levels which meet the requirements of the Team regarding more precise estimates (Stage 1). Diagram 24 illustrates the basic structure of the three-stage Product Backlog. It describes which state requirements are in the current stage. It also outlines in which direction information is coming and going per stage.